Gaskets come in all shapes and sizes: round, oval, rectangular etc. Accurate measurement size is important because it ensures that the gasket will fit properly and will not get in the way of the installation. Additionally, measurement is managed by QC, assuring that the gasket will comply with either the customer specifications or tolerances given by specific cut gaskets standards such as ASME B16.21 & EN1514-1. To help illustrate some of these points I am going to give you two specific examples of what to measure and what to avoid doing. Ring gaskets are quite simple to measure because you only need to verify two measurements: Inside Diameter (ID) and Outside Diameter (OD). Ring gaskets are generally used in raised face (RF) flanges as the gasket is centered inside the bolts. Generally, it is not recommended to use ring gaskets in full face flanges as they are thinner and more fragile. Since the ring gasket OD does not line up to the edge of the flange, any bending of the flange (flange rotation) caused by tightening bolts could result in severe damage. Full face gaskets are a bit more difficult to measure because there are five things that you need to verify correctly: Inside Diameter (ID), Outside Diameter (OD), Bolt Circle Diameter (BCD), bolt hole diameter and the number of total bolt holes. Full face gaskets are commonly found in flat faced flanges but are also occasionally used in raised face (RF) flanges. For ease of use in RF flanges, installers insert the gasket between the two flanges and insert two or more bolts to align the gasket before installation. Although using a full face gasket in a RF flange adds cost to the installation, this minimizes the gasket from being improperly centered and makes the installation process easier. The most common hand tool used for measurement is a tape measure or ruler. Either can easily allow the person to check the ID and OD of the gasket by visually verifying the dimensional increments on the tool. Bolt holes and the bolt circle diameter of a gasket are a little trickier; however consistent measurements can be obtained with a little practice. These types of measurement tools should not be used when high precision measurements are required. Vernier Calipers are another handheld tool that are much more accurate than rulers and tape measures. The digital read allows measurements to as low as 0.001” increments. Vernier calipers come in various size ranges, so if you have range of gaskets sizes to measure, there is a good chance that may need two or three sets to cover the full range of sizes that you need. The two methods I have listed above both have one major disadvantage in common when it comes to measurement – human error. When trying to measure gaskets, they can become “egg shaped” or oval. The simple way to eliminate this error is to use a jig or a pass/fail fixture that allows you to insert the gasket without having to physically measure it. If the gasket fits, it passes and if the gasket does not fit then it is rejected. The down side to this type of fixture is that it can be costly to make and you will need a fixture for each individual gasket size. So there you have it! I hope this gives you some oversight on what to look for, or consider when determining gasket measurement. As a manufacturer of gasket material, a common question we are often asked is, “How can you cut this”? It’s a great question that can yield several options based on the knowledge of our experienced gasket engineers to help meet your needs quickly and economically. When it comes to soft gaskets, there are three main cutting methods with each providing its own pro’s and con’s depending on the gasket requirements. The main considerations for each method are time, quantity, tolerance requirements, material scrap/yield and the quality of cut. 1. Manual cutting methods are very common and generally performed in plants for jobs that require custom gaskets to be cut in the field. The material can be cut with a utility knife, scissors or shears, or even by a battery operated device. The dimensional tolerance of hand cut gaskets is based on the person cutting the gaskets, however, realistically the tolerance on most hand cut gaskets would be greater than +/- 3.2mm (1/8”). Additionally, with hand cut gaskets, there is usually more than one scribe or cut mark, which can potentially lead to jagged edges or nicks in the gasket, thus creating a weak point. Manual cutting is somewhat slow and tedious, and tends to result in a higher yield of gasket scrap or waste. 2. A Clicker press is another method that is commonly used in higher production runs. A rolled steel die is made up and then the die is placed on the material and pressed into it by a pneumatic press. The tolerance of the gasket is much higher than manually cutting and the material yield is much better. The process is still done manually, however, the yield of material is based on the user/operator. The process is economical for larger gasket quantities because a die still needs to be made for each size and there is some maintenance involved in sharpening and maintaining the dies. Die cutting is not recommended for larger OD gaskets, or custom sizes that required small quantities. 3. CNC digital cutters utilize a 3-axis cutting head that have either an oscillating head or drag knife that cuts the material. Gasket dimensions are converted to CAD drawing file(s) and then uploaded into the machine to be cut. The big benefits to using these types of cutters are the speed, high level of accuracy and material savings due to being able to nest all the gaskets together for the optimal yield. Additionally, for custom size gaskets there is no die or tooling required just a CAD drawing to upload. Literally the operator can put the material on the table, nest the gaskets desired to cut and hit start and walk away. We have many custom fabrication capabilities and we’ve seen success with all of these in different materials on our product line. If you don’t produce your own gasket material, one of the most important things you can do is ask your gasket manufacturer how they would recommend you cut the material. It sure beats wasting time and precious material! Custom Cut Gaskets, made to order. Simply send us your CAD file, detailed drawing or gasket photo and we can manufacture your fully customized gasket design. The end result is a quality gasket, made to your specifications, priced right and shipped in days. Contact Us Now! The importance of plant operators and operations in water treatment facilities selecting the right gaskets cannot be overstated. Unfortunately, they are often the last thing that anyone thinks about, and are in most cases considered a commodity item. However, most operators say that it is gaskets that can cause the most “pain” on a day-to-day basis. This means that selecting the right ones is important for process safety, environmental protection, service life, and maintenance and inventory costs. The National Sanitation Foundation (NSF) has created standards that are intended directly for drinking water and systems that treat and deliver it. NSF/ ANSI 61 standard is based on the health effects of drinking water components. Unfortunately, municipal facilities do not always use NSF 61 approved gasket material. Red rubber, styrene butadiene rubber (SBR), is continually used for potable water applications. But, it is not an ideal gasket material because it is a pure elastomer which naturally degrades over time, because of natural environmental conditions. Red rubber also has a very low compressive strength, generally in the range of 800 psi – 1200 psi, which can result in the material crushing if these values are exceeded. In most flange pipe connections, the amount of torque applied to the bolting to achieve a minimum bolt stretch of 40% may exceed these values. Failing to stretch the flange bolts to this minimum yield can be problematic because the bolting material is not within its elastic region, and cannot create a “spring like” clamping effect on the flanges. This can result in a leak, or perhaps a blow-out failure. The chemical resistance of SBR is relatively low against common water treatment chemicals like sodium hypochlorite, caustics, chloramine and others. These chemicals can aggressively attack the red rubber, resulting in a rapidly degraded or deteriorated gasket. When the gasket is chemically attacked, it is susceptible to leaks, failures or perhaps even a gasket blow-out which can seriously harm plant personnel if they are sprayed with these chemicals. For general plant services that process non-potable water, steam and various forms of waste products, compressed non-asbestos (CNA) gasket material is a good choice because of its good sealing characteristics, ease of cutting and relatively low cost. CNA gasket material has three main components: fibre (15% – 35%), binder (10% – 20%), filler (50% – 70%). Additionally, there is a small percentage of vulcanizing chemicals which are usually solvent based and used to cure the rubber based binders during manufacturing. Fibre is added to the CNA gasket material to provide increased mechanical properties like tensile and compression, and can include aramid, cellulose, ceramic and glass. The binder is usually composed of an elastomer, namely nitrile, styrene butadiene rubber, or even ethylene propylene diene monomer rubber, which keeps the sheet bound and gives the gasket material added flexibility. Fillers such as silica, mica, clay or even powdered graphite can be added to help control creep and reduce cold flow. Additionally, using fillers helps reduce the overall cost of the sheet because it consists of 50% – 70% of the total material. When selecting a CNA gasket material for potable water, the user should make sure they use a NSF 61 verified material to ensure that they are not contaminating the water source. Because CNA gasket material contains a rubber component, the material still does have a shelf life. Over time, the rubber will start to break down and deteriorate, based on exposure to environmental conditions. Due to the rubber component of this type of gasket material, it is not recommended to seal applications that involve acids, or caustics which are used in pH control prior to the clarifying stages or even disinfection chemicals such as sodium hypochlorite (NaClO), 12% solution. Even polymer-based chemicals used in wastewater treatment, including flocculants, coagulants and defoamers, can cause deterioration in rubber-based gasket materials. Therefore, it is very important to test the chemical resistance of the gasket material used with each chemical and to measure the concentration. For critical service and chemical applications, filled polytetrafluoroethylene (PTFE) gasket material is an excellent choice because of its in-service longevity, chemical resistance and high sealability. PTFE has an infinite shelf life; therefore, it does not break down during exposure to environmental conditions. This makes it a superior choice for applications that are not easily accessible or perhaps buried underground. PTFE is also inert to almost every chemical, making it a great choice for chemical applications. Pure virgin PTFE has high creep/relaxation characteristics, so it is not a good sealing material. To help prevent material creep, gasket manufacturers use engineered filler systems that can consist of glass, barium sulfate and/or carbon. Filled PTFE seals at a much lower gasket stress than compressed non-asbestos products. However, it can also withstand loads of up to 15,000 psi, which is more than 10 times the compressive strength of red rubber. 75 mm, 200 mm and 300 mm 150# ANSI flanges can be problematic to seal due to the low cross-sectional “bolt area” to gasket “sealing area” ratio. Full face gaskets are also difficult to seal when compared to ring gaskets, due to having two to three times more sealing area. For these applications, filled PTFE is a preferred sealing material. Full face flanges are generally found on pumps and cast iron 125/250# piping. In many cases, you cannot generate enough gasket compression stress to create an effective seal without damaging the flanges. For these flat face flange applications, reducing the gasket area will help increase the gasket stress. When bolting up the gasket, a reduced contact area gasket made up of filled PTFE, will allow the full face skeleton design to support the entire flat face flange. It will also prevent any damage that may be caused by bending or flange rotation if a ring gasket were to be used. The application will influence the gasket selection; however, proper gasket installation is equally important. Based on 100 gaskets analyzed and material collected from the members of the Fluid Sealing Association, up to 85% of gasket failures were due to faulty user installation. Sixty-eight percent of the gaskets failed due to under compression, while 14% failed due to over compression. It should be noted that both under and over compression of the gasket can be prevented if installers use a proper tightening method, recommended torque value and a calibrated torque wrench or other tightening device. For proper gasket installation methods, users can reference the ASME PCC-1 post construction guideline for pressure boundary bolted flange joint assembly. Gasket manufacturers provide recommended torque values and installation procedures. Click here to view other articles from this issue (Dec 2017). Triangle Fluid Controls (TFC) proudly congratulates Chett Norton as the recipient of the FSA Award of Merit in recognition of his exceptional technical contributions to the Association and for his efforts to promote the mission of the FSA. The Award of Merit is presented by the Board of Directors and the Members of the Fluid Sealing Association and was established to recognize distinguished or exceptional service to the FSA by an individual member and granted solely on merit and participation in all activities that support the FSA mission. 2016 Randy McKay Award of Merit goes to….. The award includes two pieces: an engraved glass plaque and hand-blown glass sculpture made in a similar shape, style, and colouring to TFC’s company logo. The glass plaque will hang in TFC’s lobby with each year’s winner added to it. The making of the pieces, commissioned by a local glass blower in Wellington, Prince Edward County, and was completely documented and can be found posted online on TFC’s social media channels or by clicking here. When it comes to finding the appropriate gasket material for your system, gasket selection can be one of two things: confusing or intimidating. Some are not sure where to begin, while others find the thought of dangerous leaks or costly shutdowns put them on edge. To help ease the selection process pain, we have developed a few simple tools that will help with gasket selection. The first, a simple gasket flowchart, will help narrow down which Durlon sealing product is best based on a few simple operating condition guidelines. 1. Critical service can be any factor essential to plant operation or personnel/plant safety and can include environmental compliance. Failure or disruption of any critical service could result in serious impacts such as fines, time loss and/or injuries. *Note: This information is a general guide for the selection of a suitable gasket material. Triangle Fluid Controls does not accept responsibility for the misuse of this information. Gaskets are composed of and contain various binders, fillers, materials and metals. Each gasket type or material can have very specific pressure and temperature parameters that affect the performance of the gasket. For compressed non-asbestos and PTFE gasket materials, both temperature and pressure are critical and the result of not verifying these values could result in a leak or possibly a blowout. Generally, as the temperature increases, the material pressure rating decreases for that material. To help identify pressure and temperature limitations of a product, there are Pressure vs. Temperature charts (also known as P x T charts) that will essentially give you a “Yes” or “No” answer when selecting material. When the intersecting point of both the pressure and temperature of your application are inside the material boundary (green area below), it lets you know that material is safe to use for your application. Media can be verified by simply checking out a chemical resistance chart and verifying whether the material is chemically compatible. Unfortunately, most chemical compatibility charts are based on standard concentrations at room temperature, so you may find some ratings as ‘C’ for caution or ‘N/A’ for unknown. In these cases, contact TFC engineering for further information. Here’s an easy tool we developed to help identify chemically compatibility (resistance). Click on the image to use the tool. You should always feel confident that you are using the correct material for installation, but if you are still unsure, I highly recommend speaking with a trained applications engineer. Contact us to learn more about gasket selection from the fluid sealing experts at TFC. Subscribe to Our Quarterly Newsletter For More! Why are in-line check valves so expensive? As Canada’s national DFT Check Valve channel partner, we speak with many different people across many different industries in need of an in-line check valve. Once we’ve priced out a valve that fits someone’s needs with custom sizing, trim and exotic metals, it’s common for a new user to baulk at the price tag. We’re used to hearing the question, “Why are check valves so expensive?”. That is why we feel the time has come to address one of the biggest factors in a customer’s buying decision: cost. Cost is a factor that tends to make a rookie salesperson uncomfortable, and I won’t lie, check valves aren’t all inexpensive. My intention is not to have you buy the most expensive valve on our shelf today. It is to have you look past the initial, upfront costs, and instead consider your needs combined with the lifespan you would like to get out of your valve. Are you dealing with a fluid that is highly acidic or caustic? If so, the trim in these applications may need to be of a higher-grade alloy than the standard offerings of 304 or 316 SS (stainless steel) for chemical resistance purposes. If required, most check valve manufacturers can offer you trim and casing choices ranging from alloy 20 to titanium. However, dependent on which alloy is needed, some prices will be inherently more expensive. Does your pump have a high cycle rate? This is where a simplistic valve design and custom sizing become important. With fewer moving parts than swing checks and double door designs, there is less chance of parts breaking off the valve and potentially damaging other components in the system. As we have explained here proper check valve sizing is essential to ensuring they function correctly and do not prematurely wear out internal components. Building a design around your flow and pressure needs, is the key to having a worry-free valve in service. Do you have water hammer problems? The DFT valve design virtually eliminates this costly and damaging issue. Again, this can be handled by custom sizing your valve for the application, not the line size. Unlike a swing check, DFT silent check valves do not rely on gravity or fluid flow to close. Instead, the disc closes by the spring assist, just a short distance from where the disc must close to prevent backflow and water hammer on both sides of the valve. Ask any Production Manager this question and they cringe. Imagine stopping production in a plant of 200 employees that make $20/hour CAD for an entire 8 hour work day. That’s $32,000 CAD in lost revenue for just a single day. Or imagine stopping production in a Northern mine where underground and service miners typically start at $21.50 CAD and are onsite 12 hours a day, 7 days a week, for 2 weeks at a time. An inferior check valve installed for de-watering in this instance could fail and lead to high revenue loss from labour and downtime. Problem: A chemical facility in the USA, was experiencing extreme water hammer and pressure spikes with their cycling double door check installed in a cooling tower loop pump discharge application. This caused damage to the check valves and components around them. The 10” double door valves being used at the time, had to be replaced every 6 months due to cycling. Solution: Three – 10”, 150/300# ALC Check Valves replaced the worn double door check valves eliminating the water hammer and the valves have performed well since installation. Problem: A food processor in the Midwest was requesting assistance in their wash down stations that must be sanitized using very hot water at 74°C (165°F) or higher. Solution: The DFT® model SCV® Check Valve was used to meet safety needs and criteria. In Service Since: The 1950’s & 60’s. Problem: A petrochemical plant was experiencing swing check valve failures. The plant was part of an OEM turbo-expander that originally installed swing check valves. These original valves had failed quickly due to low flow and excessive cycling/pounding. Solution: The DFT® model GLC® Check Valves were custom-sized for this application to minimize excessive cycling and chattering problems that were seen with the previously installed swing-type check valves. Find This Helpful? Subscribe to Our Newsletter! You take a gasket, put it between two pipes, tighten the bolts and voilà…..it’s done. Although this seems like a straightforward process, even to a seasoned veteran pipefitter, it can be tedious or downright scary if proper care is not taken during the installation process. To help with gasket installation, I have compiled a list of 6 of my favorite tools that will help even the most novice pipefitter install gaskets with ease. Before reading this list, you should already know how to install a gasket. They can come in many shapes, sizes and styles ranging from the basic beam, clicker wrench or even electronic wrench. In 60% of gasket failures, the main cause of the failure is linked to under loaded gaskets. Applying the correct torque helps ensure that you are properly stretching the bolts, which in turn act like a spring pulling the flanges together, creating load on the gasket and achieving an effective seal. 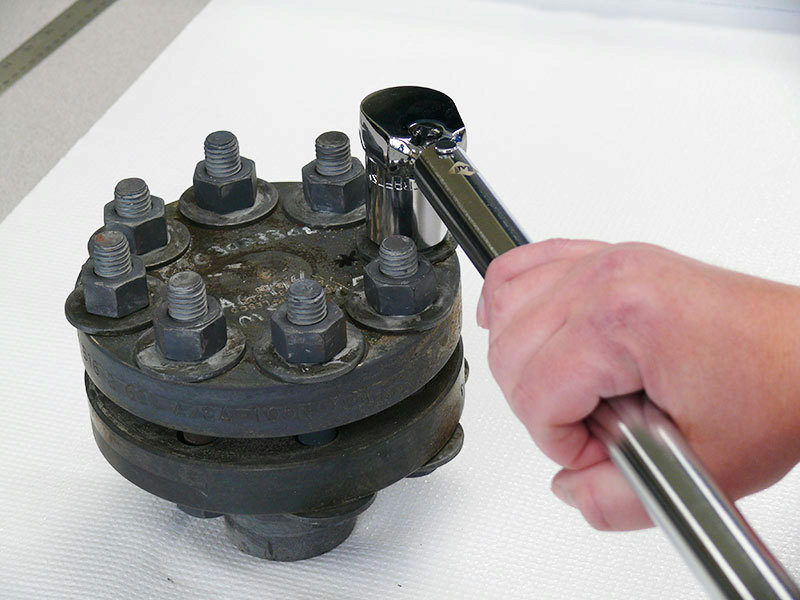 Torque wrenches can range in price and accuracy, however, despite the tool’s price tag, a torque wrench is only as good as it’s last calibration. So be sure to do this before putting it to use. These little dandies are very important in the gasket installation process. An important thing to remember is that bringing the flanges together in parallel ensures maximum contact between the flange and gasket. This transmits the most load that can be applied to the gasket, increasing the chance of success with your gasket installation. When you are tightening the bolts, it is important to measure the gap between the flanges, around the flange circumference in a minimum of 6 spots. If the gap is uneven, loosen or tighten the appropriate bolts until the gaps are within 1/32” (0.8mm). Once the flange gap spacing is evened out, you can continue with your cross star tightening pattern. The flange gap should be checked between every tightening round, paying special attention to first 2-3 passes. These hardened tapered steel pins aid in the alignment of flanges. Inserting a minimum of two drift pins into the flange bolt holes helps with two things: flange hole rotational alignment and centre line high/low alignment. After these pins have been inserted and the flanges are properly aligned, the bolts can be inserted with ease for future tightening. Tight quarters or flanges that have very little spacing or clearance make it difficult to install a gasket and can increase installation time. Prying flanges apart with a bar or screwdriver is not a good idea, nor a safe one. Flange spreaders allow you to safely increase the gap between the flanges and give you enough room to remove the old gasket and insert a new one. Perhaps one of the cheapest items on the list, but a useful one. A permanent marker such as a “Sharpie” allows you to number the bolts correctly so that you can follow a cross bolt tightening pattern during multiple rounds of tightening and not forget where you left off or which bolt is next. This is not necessarily a physical tool, however, it can help a great deal with the installation procedure. These documents give the installer step-by-step instructions of the installation procedure in a check list format with the appropriate torque values for the installation. These sheets can also record the size, class, condition, bolting material, lubrication and installer. These installation details can be recalled at a later date and may help you will troubleshooting a problematic flange or a difficult sealing application based on previous installation history. Hopefully you found my recommendations useful and have learned something new. If you haven’t tried any of the tools I mentioned, give them a try to compare things like ease of installation, tool usability, and installation time. Until next time, work safe, work smart and most importantly……keep the fluid between the pipes! If you would like more detailed information related to gasket installation, contact us. 1. Critical service can be any factor essential to plant operation or personnel/plant safety, and can include environmental compliance. Failure or disruption of any critical service could result in serious impacts such as fines, time loss and/or injuries. NOTE: This selection chart is for general use only. For critical applications consult with Triangle Fluid Controls technical department. Triangle Fluid Controls does not accept responsibility for the misuse of this information. 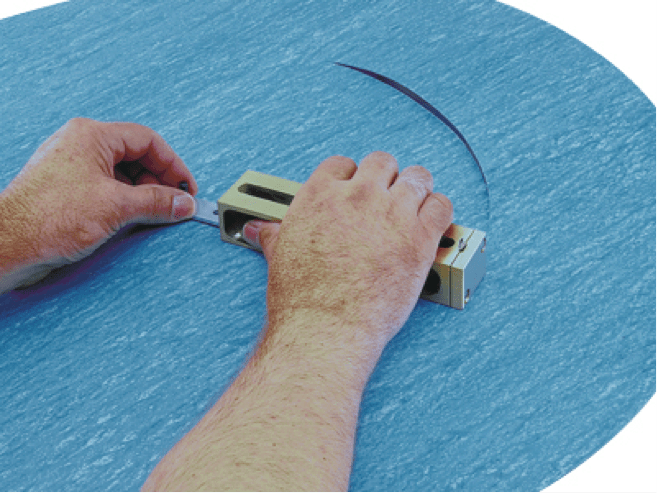 Finding a reliable sealing solution has never been easier! Triangle Fluid Controls (TFC) the manufacturer of Durlon sealing solutions is excited to present a brand new video series, SEALutions, that answers basic fluid sealing questions in 1-2 minute videos. Topics will range from gasket installation to reusing gaskets and troubleshooting joint leaks, among others. SEALutions will star TFC’s Gasket Guru, a hands-on, tech guy with a plethora of fluid sealing knowledge to share. Starring as the Guru will be none other than TFC’s QA & Engineering Manager, Chett Norton. Chett has 14 years of experience in fluid sealing and industrial process and is a certified member with the Ontario Association of Certified Engineering Technicians and Technologists (Mechanical Discipline) as well as an active participating member of the Fluid Sealing Association’s Gasket Technical Committee. TFC has released a teaser video that can be viewed below. Stay up to date with SEALutions by subscribing on YouTube. In the meantime, you can reach the Guru by e-mailing [email protected] for your fluid sealing needs.